Ensure comfortability and safety by following these simple instructions on the proper wear of your Seven Baby™ Wrap. In addition, please be sure to read the &ast;additional safety tips at the bottom of this page. Find the Seven Baby™ logo at the center of the wrap. Face the logo outward and place it over your navel. Take the remaining fabric and wrap it under each arm to your back. Keep the fabric as flat as possible and bring one end over each of your shoulders crossing them behind your back. With both ends in one hand, fold them under the front (labeled) section, and pull them down to provide a snug fit. Continue pulling the ends down, and the labeled section of the wrap will shift upward. 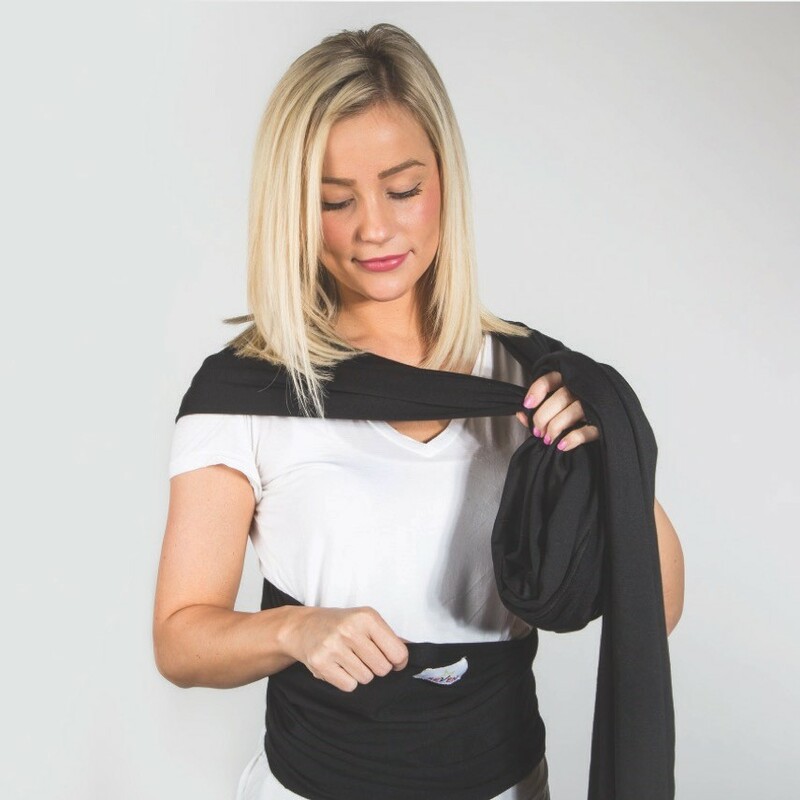 Adjust the wrap to fit close against your body. Continue to keep fabric flat and cross again in front of your body. Wrap the ends around to your back. Ensure the wrap is still snug against your body. There is no need to leave extra space for your child, the fabric's nature guarantees plenty of room. You are now ready to secure the wrap. If additional length remains, wrap the ends once more to the front of your body. Double-knot the wrap in either the front or the back of your body, depending on your comfort and the amount of fabric remaining. Please consult with your healthcare provider prior to using the Seven Baby™ Wrap. Wrap with babies weighing 8 lbs or less. 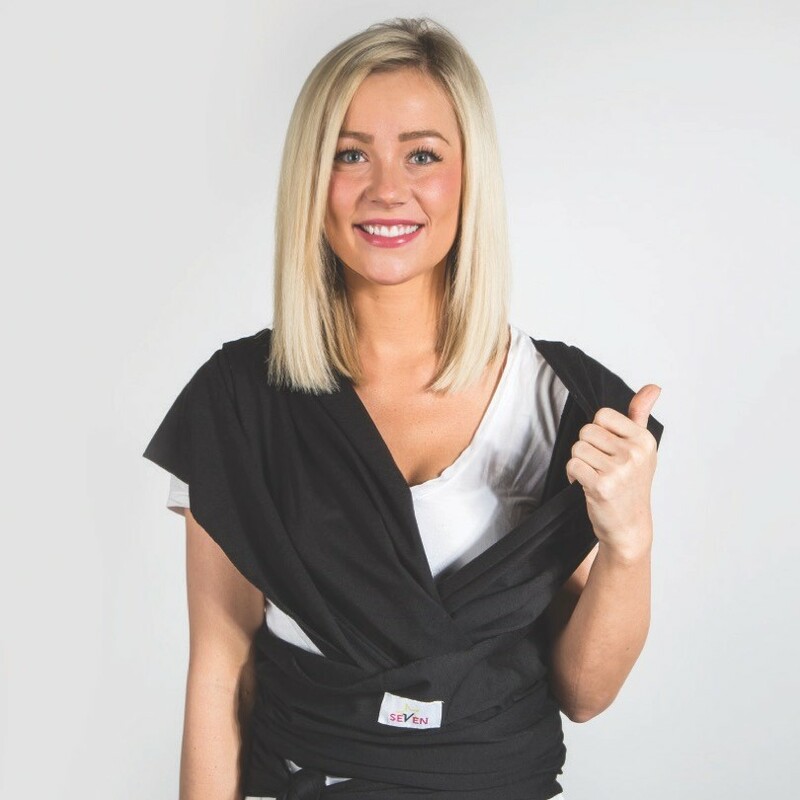 In addition, please be sure to read the &ast;additional safety tips at the bottom of this page before using the Seven Baby™ Wrap. Once you have successfully put the wrap on, find the shoulder piece that is closest to your body. 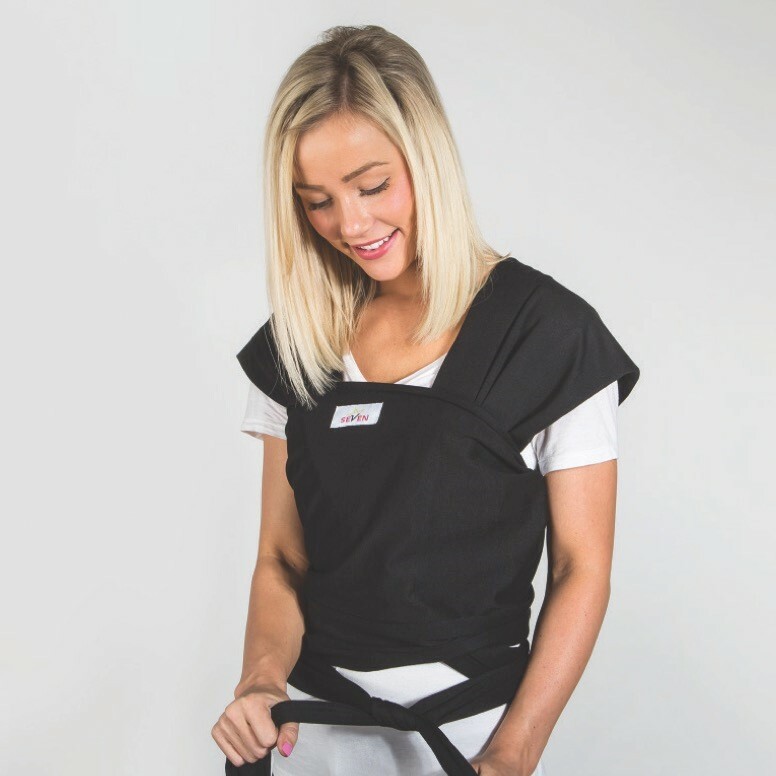 Hold your baby securely and slide their leg into the shoulder piece. Pull the fabric so that it fully covers your baby's bottom. Continue to spread it over their back and shoulder as well. Your baby will be more comfortable the further you spread it. Locate the piece of fabric with the Seven Baby™ logo on it. Pull that piece up and over your baby's bottom all the way to the back of their neck. At this point, your baby's legs can be inside or outside of the fabric. Either is fine, just go with what is most comfortable for you and baby! Grab the shoulder section that lays closest to your body. Pull the fabric away from your body, creating space for your baby. 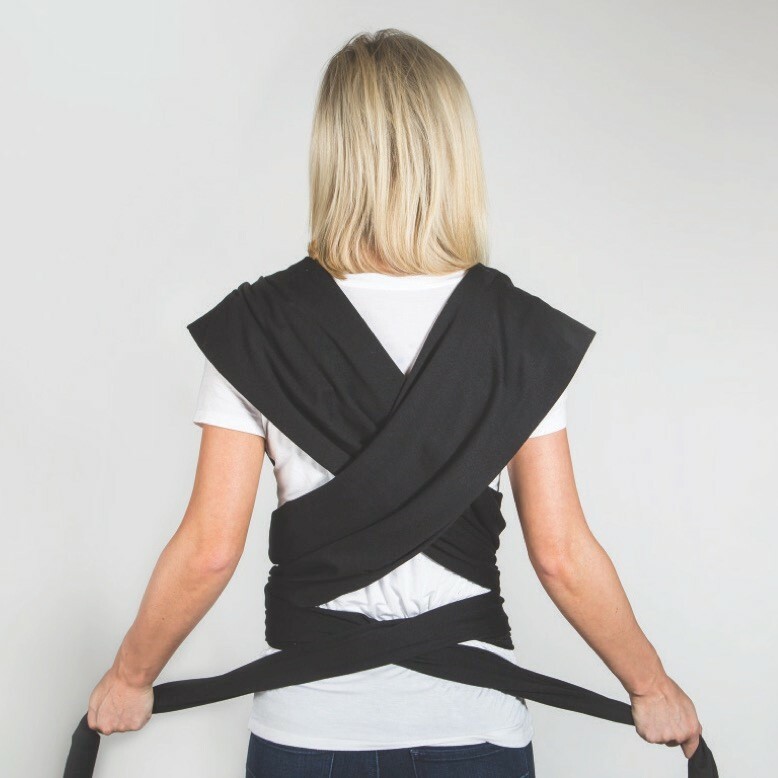 Assure the wrap remains secure around your body. Time for baby! Keep your baby's legs tucked together and gently guide your baby into the space you created in Step 1. Once there, pull the fabric from the shoulder section to cover your baby's torso and back. Spread the opposite shoulder piece over your baby's body. Make sure to securely hold your baby the entire time, maintaining emphasis on supporting their head and neck. 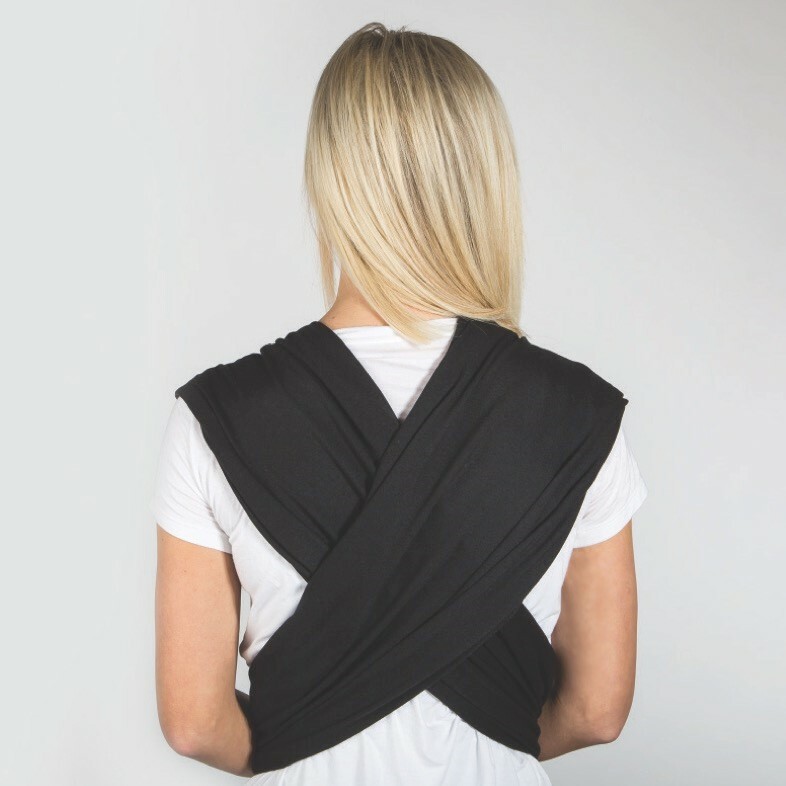 Grab the section of fabric with the Seven Baby™ logo and pull it upward over your baby's back and neck. 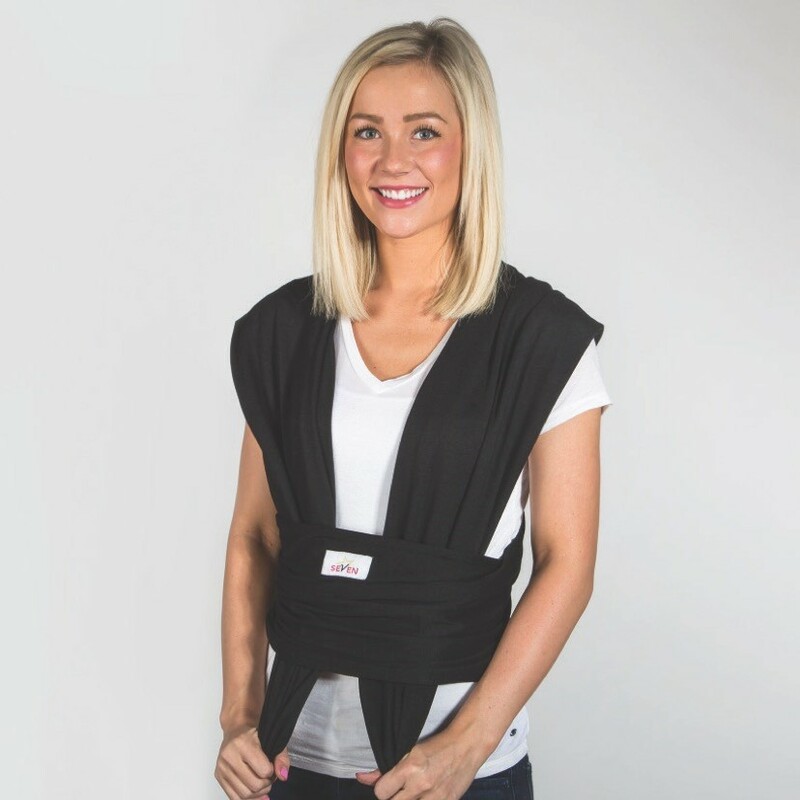 Once you are wearing your Seven Baby™ Wrap (see pgs. 1-2), the two overlapping pieces that cross in front of your chest should be snug against your body. 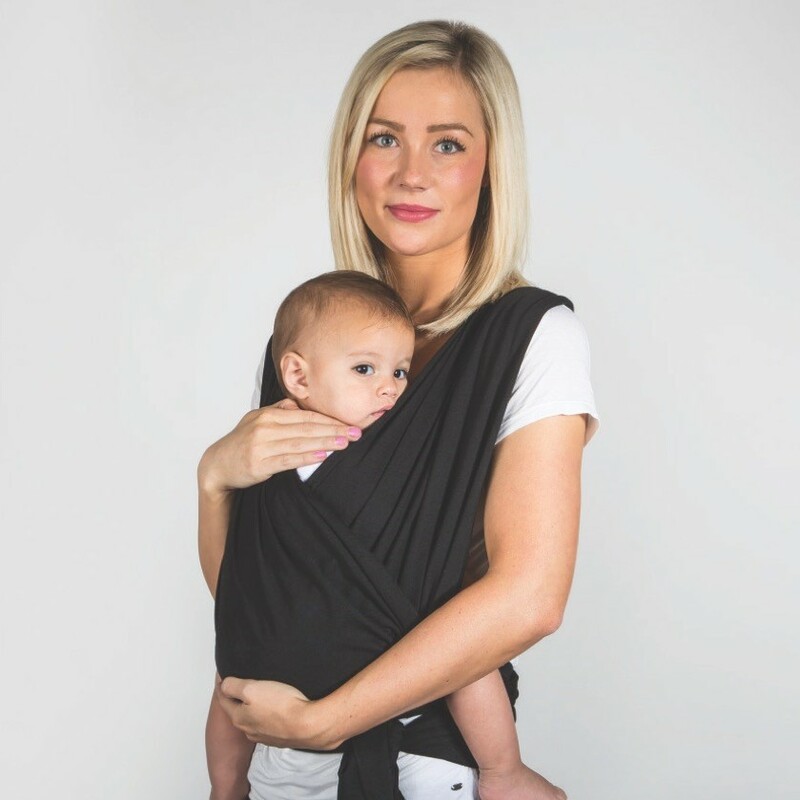 Before placing your baby inside, test the wrap by pulling, then releasing each fabric section, to ensure they cling back against your body snugly. Do not leave any extra space or loose fabric. 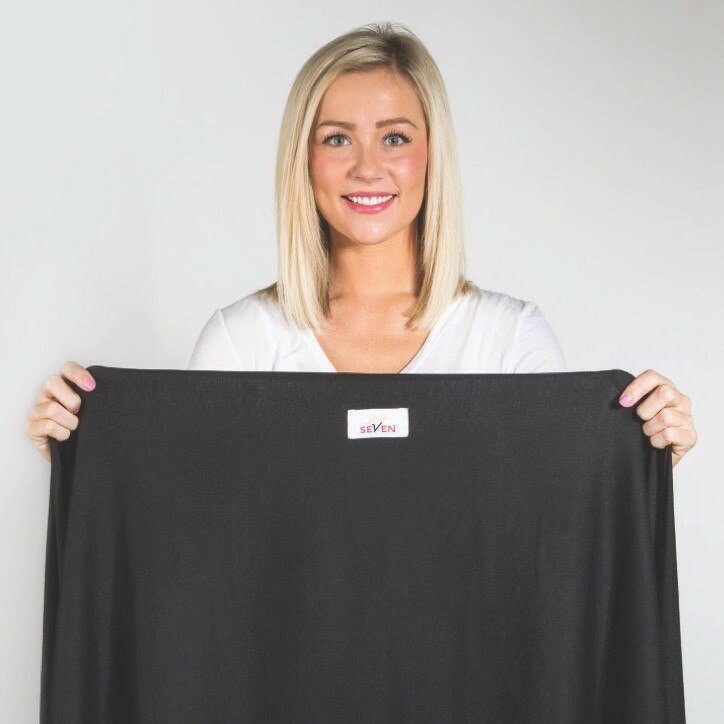 The fabric will properly stretch once you place your baby inside. Before placing your baby inside the wrap, check the 'X' that is formed in front of your body to make sure the center of the 'X' crosses over the center of your chest. This will ensure you are carrying your baby at chest level and your baby is in 'kissable' distance. Gently tuck your baby's head under the labeled section of fabric if your baby falls asleep. Be sure the fabric does not cover your baby's face and your baby has a clear and open airway. To ensure an open airway, always make sure your baby's head is parallel to the ground or slightly tilted upward. Your baby will usually make you aware when they are ready to move on from the "Cherub" hold by stretching out their legs or feeling unsettled. Pay careful attention to these signs, because they indicate they are ready to move to the "Bond With Your Baby" hold. 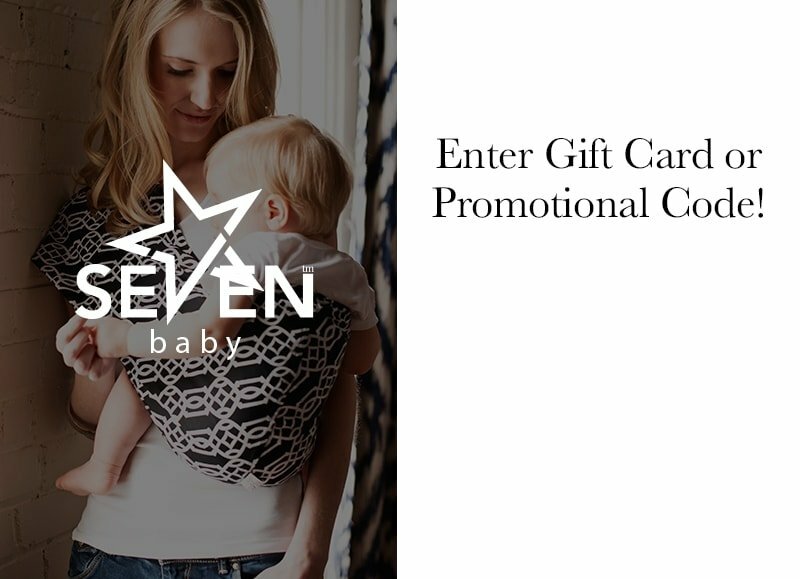 Seven Baby™ Wrap relies on proper wrapping and tying rather than buckles or other attachments to secure it in place. It is important that you thoroughly read all the instructions and tips on how to use and put on the wrap before wearing your baby.